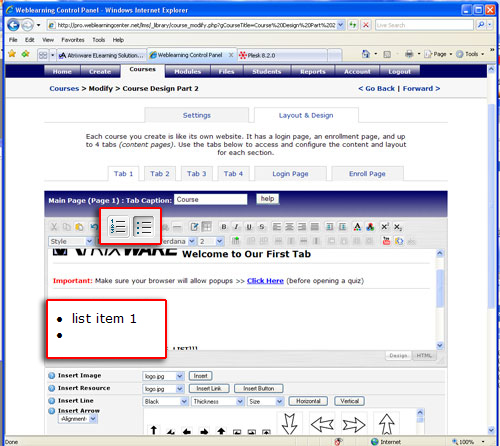 In the previous 2 articles, I have gone over many of the features used to customize our course pages. In this article I will be discussing a few final options that you may commonly use. I will be covering how to add a hyperlink, inserting a list, using Placeholders. 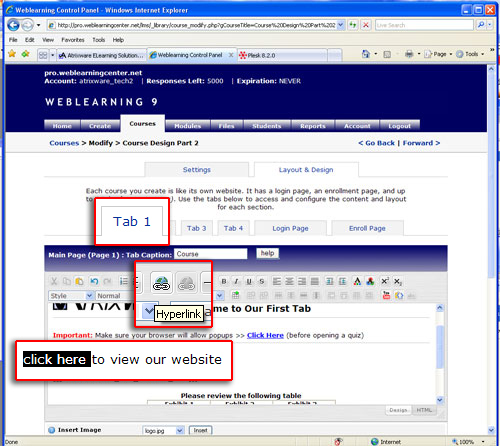 Making text link to a site is a very easy process in Weblearning 9. Simply type a line of text in your editor such as “click here to view our website.” Select the click here text and click your hyperlink button in the top menu. Enter the web address you want to link to then choose if you want to open the link in the same window they are in or a new window (recommended). Easy enough right? Creating a list is just as easy. The first thing you need to decide is if you want an ordered list (puts numbers before each list item) or an unordered list (bulleted list). Once you have decided, click the appropriate list button. I am going to create an unordered list. Start typing in your editor and you will notice a number or a bullet appeared before your text. Finish typing your list item and hit return. Since the list button is still selected, it will keep adding bullets or numbers for every line until you click it again to deselect it. Now we will move on to working with Placeholders. The concept of using placeholders is a bit more advanced than what I have covered in the previous 2 tutorials. 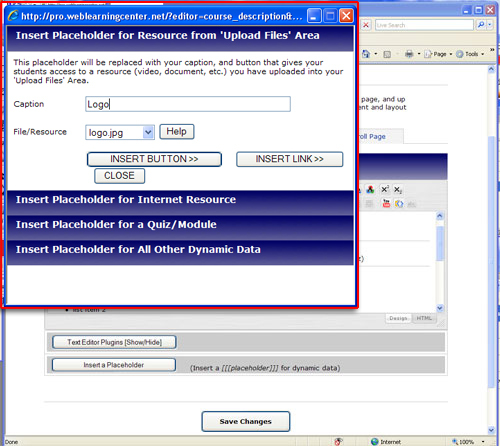 At the bottom of your editor, click on the button that says Insert a Placeholderand a popup window will appear. Note: If you are on the login or enroll page, will not see all of these options. Before we begin, I will give you a general idea of what a placeholder does and how it is rendered. A placeholder allocates space for an object that you want to add. However, it will not display the file or text in the editor because it does not know what the file is yet. Instead it is represented in the editor by something that looks like this [[[PLACEHOLDER_FOR_MODULE_LIST]]]. 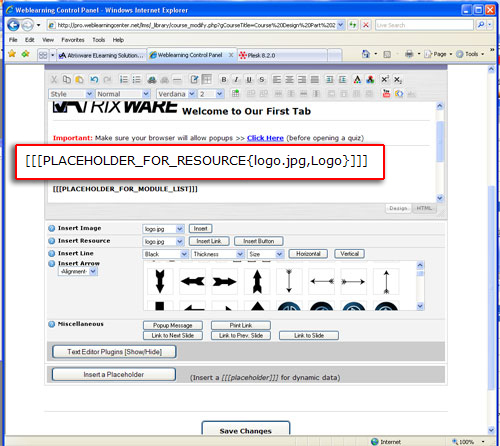 This placeholder uses the same concept as the placeholder above but will link to a file that is on the web. For example, you may have a logo on your website and just want to link to it rather than upload your file to the Weblearning system. Note: This will not create a text hyperlink, it will display the linked image. This placeholder allows you to put all quizzes (already in the editor by default) or specific quizzes that you have created in a list. If you do not want to list all of the quizzes for a course, you would use this placeholder to select the appropriate quizzes. 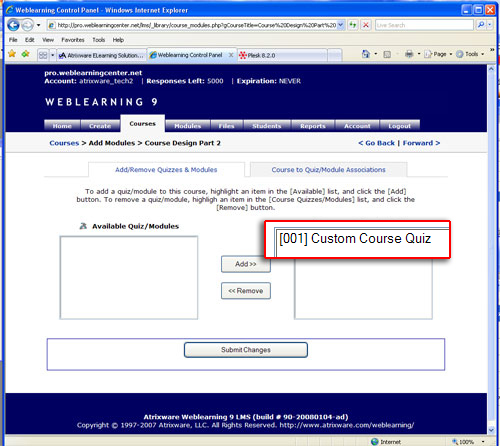 To select a specific quiz, you will need to know the slot number where it is located. If you are unsure what number it is, click the Courses tab > admin tools > Modules Add/Remove and find the number to the left of the quiz that is available for that course. These placeholders will allow you to add a score history, extended score history and other courses. Add any combination of placeholders you wish to use and click insert. The popup window will not close but the placeholder was added to your editor. I added an image that I have previously uploaded to Weblearning. Now preview what you have added. You will see that your placeholder was added. There are a few other design options that I have not discussed. By now you should be comfortable with using the editor and should try out any additional features on your own. This will conclude the course layout design features. I hope this clears up any problems that you may have encountered or features you did not understand. Good Luck. 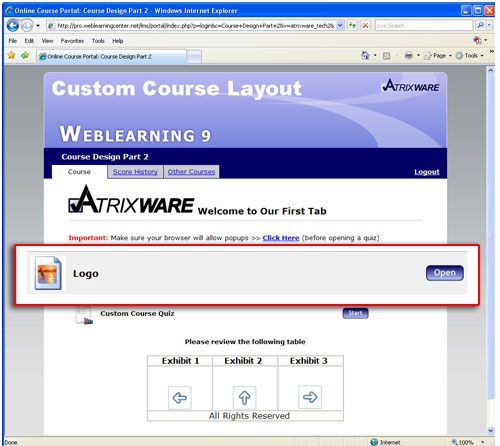 This entry was posted on Friday, February 29th, 2008 at 2:44 pm	and is filed under Atrixware 101, Dan, Weblearning. Both comments and pings are currently closed.